It wasn’t long before Unai Emery was back in charge of a team. In January 2013, the Basque coach returned to Spain to take over the reins at Sevilla FC, who weren’t having a good season. With Emery in the hot seat, they managed to get up to ninth position and improve the team in many aspects. 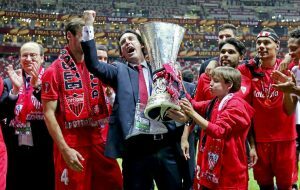 Due to the financial difficulties of teams who had finished higher in the table, Sevilla qualified for the UEFA Europa League, a competition that would go on to become so special for both the club and Unai himself. His first full season at the Ramón Sánchez Pizjuán was a complete success. After having sold key players such as Jesús Navas and Álvaro Negredo, Emery built a new team and led Sevilla to victory in the UEFA Europa League, beating Benfica on penalties in the final. The team finished fifth in the league, ensuring European qualification for the following season. 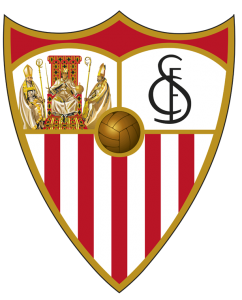 The next season saw Sevilla produce a carbon copy of the previous one by achieving the same results. They finished fifth in the league on 76 points, a record for Sevilla FC in the First Division, and they once again conquered the UEFA Europa League, this time beating the competition’s surprise team, Dnipro, 3-2. This win handed Sevilla qualification for the UEFA Champions League, due to a change in the rules. Emery remained loyal to Sevilla, despite interest from other big European clubs, and he signed a contract extension. After a difficult start to the next season, the “Hispalenses” found their form in LaLiga, although they were unable to get out of their UEFA Champions League group. However, finishing third in the group put them through to the first knockout round of a UEFA Europa League competition that they would go on to win, making history by beating Liverpool 3-1 in the final. The win meant qualification for the next season’s UEFA Champions League, despite having finished seventh in the league. It was a historic season (it would be Unai’s last one at the Andalusian club), because as well as winning their third consecutive European title, Sevilla were also runners-up in the Copa de Rey, after losing in the final to FC Barcelona.